Hello i have a question about the eye of innocence amulet. Currently i am trying to make it critical strike me when i inflict an ignite, i am wearing a shackles of the wretched gloves with assassins mark and 9 reckless defense jewels and an ambus charge armour with blade vortex as a fast hitting skill in order to see if i get endurance charges. I proc the ignites all the time but how come it is never dealing a critical strike even though the jewels and assassins mark give it a 100% crit strike base chance? Eye of Innocence can't crit. Yes (to both parts of the passive), and yes. 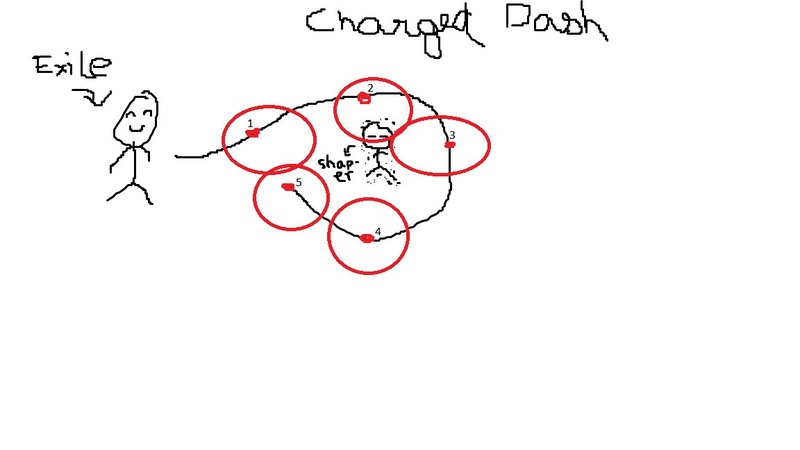 I have a doubt on how the new charged dash works based on Mark_GGG's comment here https://www.reddit.com/r/pathofexile/comments/8mvmow/could_i_theoretically_draw_circles_with_charged/dzqwbk4/ . I have a paint file attached with a rough situation where you draw a ribbon like loop around the target. In his second paragraph, "The same enemy can by hit by different waves, regardless of whether they're the while-channelling waves or the final wave", the different waves here refer to the waves generated by each stage of channeling charged dash or is it something else that I am missing here?. The red circles indicate the pulses produced by charged dash. The numbers indicate the different stages of charged dash. Assume path length is at its maximum(the mirage has come to a stop) and that for this channel, the number of stages is 5. So the question here is, would circles 2,3 do 2 instances of damage to shap-er ? I only forgot to ask for three days straight, but: Spark has a re-arm time of 1000 milliseconds. What exactly does this mean? This isn't really accurate terminology. What spark does is that every 1000 milliseconds, the set of spark projectiles from that firing lose their memory of which things they've hit. This means anything which had previously been hit by one of those sparks can now be hit by one of those sparks again. Previously this happened when one of them bouned and hadn't happened within the past 1000ms, but that's no longer the case (and would not have any effect since it now does it every 1000ms regardless of bouncing). I have a question concerning shocked status. So in the poewiki discription it is stated that enemies taking "...50% increased damage from all sources". Now i know the difference between increased and more, but i wonder if the "receiving" and "outgoing" increased damage multipiers are applied differently/seperately. Yes. "increased" and "reduced" modifiers to the same value stack additively. But modifiers to Damage and modifiers to Damage Taken are not applying to the same value, and thus cannot possibly stack addively. Modifiers to Damage are all calcualted by the attacker to get their total damage value of each type. That total Damage value is then affected by all the defender's damage mitigation, such as resistances (as well as more complicated mitigation stats). The result of that calculation is the Damage taken, and that's what Modifiers to Damage taken apply to. Shock is an effect on the enemy which modifies their damage taken, so the only things it can stack additively are other modifiers which are affecting the damage taken by that enemy, such as the Bear Trap debuff. What does the secondary duration of Frost Bomb do? The Base duration seems to be the time the Frost Bomb lasts until it detonates from my observation. Is the secondary duration the time the debuff the Frost Bomb applies lasts? From my observation the debuff Frost Bomb applies cannot stack - is my observation correct? I've noticed that projectile pierce on the tree affects minions. I also remember that Deadeye's +1 projectile worked with minions (I could be wrong on this thought). Neither of those apply to minions. What other passives work with minions then? I'm specifically interested in Elementalist's Beacon of Ruin. The only passives which affect minions are passives which explicitly say they affect minions (or those that apply aura-style effects to nearby allies, since your minions are inherently your allies). "chance to avoid Fire Damage when Hit"
For example, Monster deals a hit on Me, that bring 10 phys dmg & 10 fire dmg. 2. I'll take NO dmg at all. 1. You avoid the fire damage, not the physical damage. Lets say we wear bramblejack, and we are also a berserker with cloaked in savagery allocated and we just took a savage hit recently. Will we leech %100 of the reflect damage we deal with bramblejack for incoming melee attacks ?? Reflected damage cannot apply on-hit effects, including leech. The poe item wiki on hezmana's bloodlust states that the highest phys roll is 12-25. I however dont see anyone having higher than 10-25 like in poe trade. Could there be an error in the wiki? The wiki, while a useful resource, is created by users and is not always correct. Currently it agrees with your values, so it seems likely the information there at the time of your post was incorrect. Nowdays, if you enable the advanced mod display, you can see the ranges of any mods on your items by holding Alt (or whatever you rebound the item highlight key to). if i have a witchfire brew and a blasphemy with a curse which one gets applied to ennemies? ...the stronger one? i have a lvl 19 blasphmey with a lvl 19 flammability and witchfire brew gives a lvl 21 despair so the despair would be applied? On Incursion league, the level of temple can interfere the drops of rooms? Like rooms that Contains a valuable item? And can interfere Altar of corruption? Increasing the chance of items to not destroy?